The army on Monday foiled a major infiltration attempt by Jaish-e-Mohammad terrorists along the Line of Control in Uri sector in Kashmir, killing five members of the group's suicide squad, a senior army officer said. 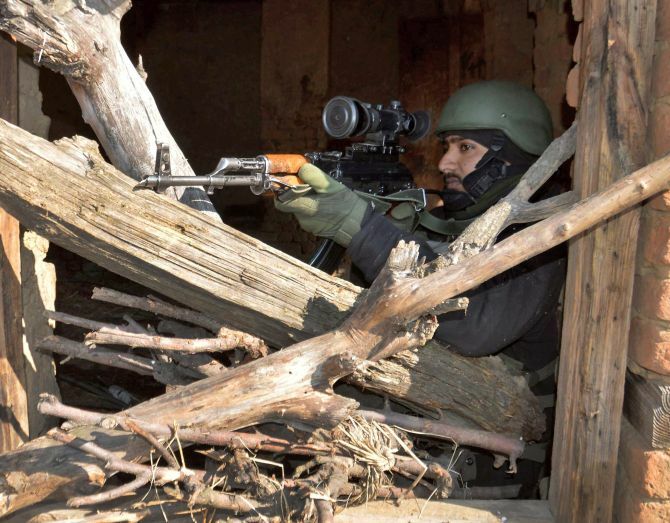 The army foiled the infiltration bid -- the first such attempt this year -- by the Pakistan-based outfit in an overnight operation that ended on Monday morning, Brigadier Y S Ahlawat told reporters in Uri, 100 kilometres from Srinagar. Brigadier Ahlawat said the infiltration attempt was made along the river Jhelum, which flows into Pakistan from India. "A major infiltration bid by a fierce fidayeen group has been foiled along the LoC in Uri sector. A major tragedy has been averted on Army Day and in the run up to the Republic Day celebrations," he said. The army officer said alert troops picked up the movement "as the terrorists were moving along the banks of Jhelum and subsequently tracked their movement." "In the ensuing firefight, the army neutralised five terrorists in the operation," Brigadier Ahlawat said, adding that four bodies have been recovered and the fifth was lying near the boat the militants had used to cross the river. A cache of arms -- including four AK-47 rifles, three Underbarrel Grenade Launchers, 38 UBGL grenades, 23 hand grenades, nine IEDs and "other war-like items", have been recovered from the dead militants, he said. In September 2016, heavily-armed militants of the JeM had carried out one of the deadliest attacks on the Indian Army and stormed their base in Uri, killing 18 Indian soldiers. Ten days later on September 28 that year, the Indian Army responded with "surgical strikes" on terror launch pads across the LoC, inflicting "significant casualties" on terrorists preparing to infiltrate from Pakistan-occupied Kashmir. On Monday, Brigadier Ahlawat said: "The Indian Army continues with its resolve to keep a strict vigil along the LoC and foil such nefarious designs of Pakistan in future too." Director General of Jammu and Kashmir Police S P Vaid earlier Monday said the terrorists belonged to the JeM group. "Three suicidal JeM terrorists killed in Dulanja Uri while infiltrating in a joint operation by @JmuKmrPolice/Army/ CAPF. Search for the fourth terrorist is still on," Vaid had said in a tweet when the operation was in progress. The toll was later updated by a defence spokesperson.